There's been another Mortal Kombat 11 character reveal during the latest Kombat Kast. This time NetherRealm Studios introduces us to a fighter with four arms named Kollector. Below is a description along with the official reveal trailer, showcasing the characters full move set against Baraka. Just be warned, the clip contains graphic content. A proud servant of the Outworld Empire, the Kollector cares only for his wealth and status and will kill anyone to keep it. Earlier this week, Game Informer also exclusively revealed the Elder Goddess Cetrion. Once again, graphic content is on display. 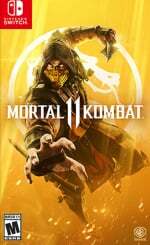 Are you looking forward to the release of Mortal Kombat 11 on the Switch? What do you think of these latest characters? Tell us down below. Don't like Kollector but Cetrion is ace! Still haven't decided if I'm getting this in any form yet but I think it looks pretty impressive. Kan't wait! This is kool. he does seem fun to play as though. Cetrion seems pretty fun to play as too, i like her fatality. @Aozz101x He was collecting Baraka's Body parts including his head! Interesting. I am looking to buy mortal kombat from the eshop. I have to say that I am preferring digital games recently. I am too lazy to change the cartridge. Kollector sounds more like an enemy from Donkey Kong Country. That's a bit much before breakfast. Centrion is as close as we'll ever get to Asura's Wrath on Switch. I’m too chikken to klikk on the link. This isn't my kup of tea. Kollector looks like something that would feature in a cheap Egyptian themed ride. Guess this is how Goro looks like when he decided to go on a diet. Wonder if Cetrion looks to be Tremor's girlfriend. He actually has six arms. Two of them are underneath his backpack, holding it tightly. I liked the first three games and then I kind grew out of it. The graphics look nice and the combat system looks a lot more sophisticated, but the violence and the speed just doesn't appeal to me anymore. @Vriess I've played and owned various editions after the first three. Personally, I could never really connect with any after due to the graphic style. While be I know on an intellectual level the graphics got a bit more sophisticated, I loved the charming realistic sprite designs of the characters versus what it looks like today. It's the same with the Resident Evil gameplay styles pre RE4 versus after. @rjejr A bit much before breakfast? Why? You don't like bloody chunks in your oatmeal? @ThanosReXXX I don't like bloody chunks anywhere now that you made me think about it. Blood and gore may of been shocking and exciting during the early to mid 90s with the likes of the first mortal kombat, splatter house 2 & 3, resident evil ect as a kid, and as a teen because it was almost forbidden, almost taboo in the gaming realm. But I'm almost 35 and completely descencitized by it all. I've seen hundreds and hundreds of horror movies alone through out the years and played numerous gory video games, I've seen it all. None of the gore in MK11 grosses me or effects me in the slightest. How can it when it's so over the top, in your face and ridiculous(ridiculously awesome mind you hehe). As far as horror games be it games or movies I'm looking to be scared or disturbed at this point in the game. Mortal kombat's gimmick is no longer unique, mind you I guess it still is for fighters. I don't recall any other fighters in this day and age that resort to all of this blood and gore. @rjejr I thought the same exact thing when I first saw the trailer, but figured no one would get the Asura’s Wrath reference. @Lordd_G I figured there would be 1. Which would be you. Also why I embedded the YT vid in case people were wondering. @WanderingZebra Good eyes, didn't saw that at first. I don't like modern Mortal Kombat's tendency to have moves that are clearly, definitively fatal....only to have the recipient get up and the fight continues. Like some of that stuff would make for good fatalities at the end of the fight. It's just weird to me whenever I see it. I'm not asking for realism, but seeing someone get stabbed through the head in slow motion, or have their bones broken....but then get up and continue to fight until the "real" end of the battle is goofy. Haven't played the old ones in a long time so maybe it was a thing there too, but I can't remember. I mean, seems like by that logic, Baraka should just get up, twist his head back on, stuff his guts back in, and continue fighting like it never happened. @Medic_alert - I am the exact opposite, Cetrion isn't vibing but I love Kollector. I'm digging these new characters, I just hope Reptile makes it in, at least as DLC. Good roster though, cant wait to play this one. Cetrian reminds me of my wife when I’ve done something wrong. I really can't get used to the new speech: "Fatality" is said before "Kollector Wins"
Kollector has 6 arms not 4. @GuarinoMatt - LMBO, I specifically searched this thread for keyword gameplay because of all this news, not too much time until release, and I'm still not sure if I'm going to buy Switch or Xbox version simply because I want to SEE what the Switch gameplay looks like... Anxiety attack.